During recent months the participants in No2EU have been discussing whether another left coalition can be put together to stand candidates against the main parties in next year's general election (see last week's The Socialist). Some leading individuals in the RMT are involved in these discussions, including general secretary Bob Crow, but as they are participating in a personal capacity, Saturday's RMT-hosted conference was not designed to discuss any specific proposals. 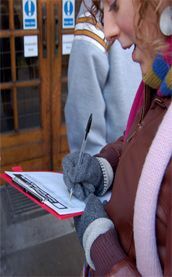 However, those who have been discussing a new coalition distributed a short text, stating: "As a minimum, we intend to stand against as many current cabinet ministers as possible, together with other ministers and prominent ex-ministers who have been complicit in New Labour's anti-working class policies". This would be "as a federal coalition under a common name, with a steering committee of participating organisations and trade unionists that operates by consensus". Platform speakers at the RMT-hosted conference included trade union leaders Brian Caton, Bob Crow and Matt Wrack; Dublin Socialist Party MEP Joe Higgins; Jeremy Corbyn MP; and Socialist Party councillor and secretary of the Campaign for New Workers' Party (CNWP) Dave Nellist. Joe Higgins emphasised that it would be futile to look to any of the Labour or Social Democratic parties across Europe for political representation for working class people, so alternatives have to be built. Bob Crow criticised the TUC for failing to counter government attacks on working people (including on the postal workers), and said the choice between the cuts programmes of the main parties is that of dying by being "knifed to death or stabbed to death". "I want my own political party that's going to go out there, roll its sleeves up and fight for the principles we stand for", he added. And he went on to say that he is supporting, in a personal capacity, a coalition to fight the general election. There were a number of useful interventions from the floor, including from the North West No2EU candidate Roger Bannister, who explained why No2EU had been right to stand against the British National Party's Nick Griffin. The conference was a welcome forum, and although no votes were taken, the attitude of most of the 350 people attending seemed to be firmly in favour of a new coalition along the lines already being discussed. The following day, at the Socialist Party's Socialism 2009 event, there was a forum on political representation attended by 200 people, with invited speakers from the Green Party, Respect, the Labour Representation Committee, the RMT and the Alliance for Green Socialism. Dave Nellist and other Socialist Party members spoke in the forum, as some of them had also done at the RMT conference the day before, arguing that as the key forces for building a new mass workers' party have not yet fully materialised, in the meantime a coalition of general election candidates standing in the interests of working class people would be an important step forward. The Socialist Party recognises that many workers may vote Labour in the general election as the 'lesser evil' to the Tories, in the absence of an established left alternative. But this is not a reason to delay creating that alternative; on the contrary it is a reason to speed up the process of building it. Although the Tories may be worse, another Labour government will also make severe cuts to the public sector and launch other attacks on workers' living standards. At both events over the weekend, the issue came up of how a new coalition should relate to the few left-wing Labour Party MPs, including John McDonnell and Jeremy Corbyn. As a number of participants in the pre-coalition discussions oppose standing against such MPs, the coalition will not do so. Unfortunately these left MPs have not used opportune moments in recent years to leave Labour, to help spearhead the development of a new workers' formation. The Socialist Party is campaigning for the building of a mass workers' party which would, in fighting for a national profile, attempt to stand in every seat. When such a party exists, or to help with the process of building it, some of the remaining left Labour MPs may leave Labour to participate in it, which would be welcome. The question of exactly when they should break with Labour is a tactical question though, linked to gaining maximum support from workers, and clearly the months before a general election might not be the best time. However the ground has to be prepared by the left generally for convulsive events after the election, when the need for a new formation will be even more sharply posed. The make-up, policies, name and structure of a new coalition to stand general election candidates have still to be agreed; discussions are on-going to try to involve as many trade union representatives (even if in a personal capacity), anti-cuts campaigners, environmentalists etc as possible. But with the general election at most just six months away, time is short, so the advice offered by Joe Higgins when he spoke, to allow the maximum time for establishing the new coalition, was very important.